"One concert" is the future and the past of St Nicholas Orchestra. From the non-folk "Ballad about St Nicholas" (marked off by a slightly different arrangement) from which the group took its name at the time when the phenomenon of folk did not exist in Poland - to the first five songs opening a new repertoire and new horizons. The songs are placed in the chronological order, according to when they appeared in Orchestra. In this way we would like to share with you the value of continuity and logic of the group's development. 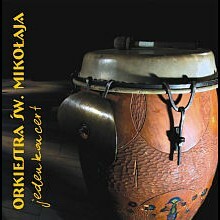 Most songs on the CD have original traditional Polish words and music. The exceptions are: the second song (melody adapted, words from Catalonia), the seventh one (music from Hungary), the ninth (a song of the Lemkos - mountain people speaking a Ukrainian dialect who used to live in the south of Poland - with a Gipsy refrain), and the eleventh (a song of the Hutsul people - Ukrainian highlanders). The choice reflects the themes and tempo of our concerts, though we usually play more Ukrainian music. The Orchestra's debut live recordings from 1992 still have their fans. Our sixth album, departing from the multi-trace recording technique, is dedicated to them. A direct contact with our listeners is the most appropriate context for our music. We hope that this album conveys its specific mood and uniqueness gained through such meetings.